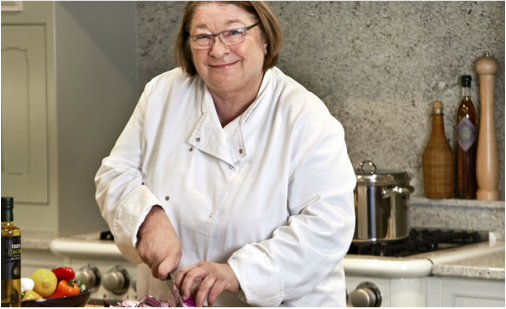 A passionate character and a great sense of humour follows Rosemary Shrager. She is a lovely and professional spokesperson who is ready to offer any advice or recipe ideas. In fact, in her interview with Sky News (below), she talks about how the public should be made aware of home baking and how we should do more of it. If you're interested in a chef for any radio or TV interviews please get in contact with us. Rosemary Jacqueline Shrager (born 21 January 1951) is an English chef, best known for being an haute cuisine teacher on the reality television programme Ladette to Lady, and as a judge on Soapstar Superchef. She also made an appearance on the reality TV show 'I'm a Celebrity, Get Me Outta Here!'. Other television projects have includedKitchen Showdown with Rosemary Shrager, where she weaned unhealthy fast-food families onto nutritious cuisine. Shrager is an accomplished chef and has worked with fellow Soapstar Superchef judge Jean-Christophe Novelli. The daughter (and third child) of John Worlledge, a company executive, and his wife June Rosemary Twentyman Davis, Shrager was educated at Northwich School of Art and Design and Heatherley School of Fine Art, with the intention of becoming an architect. She married Michael Shrager, a barrister, when she was 22; they had two children, Tom and Kate. After her marriage, she established a catering company. In 2007 and 2008, she hosted her cookery series Rosemary Shrager's School for Cooks, where ten contestants competed for the opportunity to work in a Michelin star restaurant. Shrager played the part of a strict, no-nonsense headmistress on the American reality show, The Girls of Hedsor Hall in 2009. She and, the food historian and author Ivan Day, recreated dishes cooked for Queen Victoria on the 2011 BBC series Royal Upstairs Downstairs. She is now known for cooking daily on The Alan Titchmarsh Show from 2010–12 and on What's Cooking? during May 2013. On 14 November 2012, it was confirmed that Rosemary had joined the cast of I'm A Celebrity... Get Me Out Of Here! as a late entrant and was voted out by the public on 27 November 2012, finishing in 6th place out of 12 celebrities. Rosemary appeared in the three-part BBC series, The Real Exotic Marigold Hotel, which followed a group of celebrity senior citizens including Miriam Margolyes and Wayne Sleep on a journey to India.